We went to Value Village today after work and I snapped up two fairly big mix and match bags of Lego! They were super cheap compared to what you pay retail and they had all the good pieces, like windows, wheels and tons of little guys! Suffice it to say I am now, officially, the best Mom in the world. For myself, I found a snap press in a miscellaneous bag of sewing notions for .99 and a beautiful piece of sari fabric. I also found some rickrack which is still sealed and looks like it is from the 1960s. I am looking forward to some good wardrobe refashions! 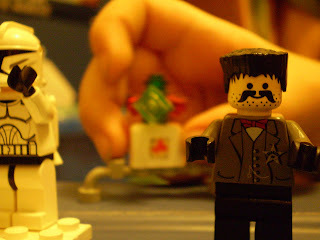 The Lego kept the boy happy, and let's face it, the man too. I made dinner while they were occupied. Not once was I disturbed. I cooked, alone in my kitchen, in total peace and quiet. I am truly Lego's biggest fan.